Lauren: I love Good Will Hunting. That’s one of my favorite movies. Danielle: You know, I’ve never seen Good Will Hunting. Danielle: Yeah I know. I know. Lauren: Oh my god, it’s probably on Netflix. Danielle: Yeah I should go home and watch it. Danielle: I was going to ask for your favorite movie at the end so that’s perfect. Lauren: Well there ya go. Danielle: How much stand-up are you doing these days? Lauren: I go back-and-forth between stand-up, sketch and improv, doing one an obsessive amount. I like to do that in an effort to never gain any momentum with my career. I think that’s a really smart trajectory. Just keep all those plates spinning, let two more crash, stack them up again, pick up the pieces. Now I’m trying to focus on stand-up more, these days. Especially because I’m about to move to New York. In an effort to rein myself in and structure myself, I’ll just do stand-up, all the time, every night. Danielle: It’s a great city to do stand-up in, right? I’ve heard it’s different from LA. Lauren: Yeah, that’s what I’ve heard too. And I hope it’s true. Not that I didn’t enjoy LA stand-up, but I didn’t, very much. In comedy, it’s so important to find your group and then it doesn’t feel like work anymore. It’s like you’re just having fun with your friends. If a million people are terrible, you can just rag on them together. Lauren: Yeah, and a lot of women. Well there’s great women in LA, too. There’s a lot of support groups [in NY]… so I hear! It could be lore. Danielle: I hope not! For your sake. So why did you start doing stand-up? Lauren: I was in acting school and they cut half of the acting company in the first year. And it was such a miserable year. It was a year of Top Model. You would have to cry to Tyra to earn your keep. Also I was just a gutter-drunk so I was like the first cut. I was an easy cut. Then I got really sad for a long time. Danielle: That usually does it. Lauren: Yeah, like that kind of rejection. Then I didn’t do anything creative for a long time. I had a friend who invited me to see his friend who was in town from LA do an open mic. And I was like, it’s kind of like acting, I guess I could try that. And I was really bad at that and arguably still am. But I haven’t stopped doing it. ‘Cause you can drink while you do it. Danielle: How long have you been doing it? Lauren: So when I went to that open mic--that was probably six years ago. But then I was kind of a wimp. I started in Austin and would just hang around and watch a lot, and sleep with comedians. Danielle: To be part of it. Lauren: Yeah, this was I-don’t-have-to-experience-the-rejection and still be part of it. Well, now I still sleep with comedians, but I also do [stand-up.] It’s a real success story. Danielle: A real dream come true. How would you describe your type of humor? Lauren: I think I’m a silly goose. With stand-up, more of the weird stuff is my humor, the weirdo bits. Mostly, I don’t think much of it is that funny, it’s just me talking. It’s been called “jokeless” or “just a girl talking fast and loud.” My guy is Steve Martin. [He] makes me laugh out loud. Actually improv actually makes me laugh a lot more than stand-up. I wish I was better at it but no. Danielle: You’re were doing [the Upright Citizens Brigade program,] right? Lauren: UCB helped a lot. I think it’s really hard to start as a stand-up and then become an improviser. I envy people that start in improv and then do stand-up. It’s like starting gymnastics at 15. Like it’s too late for me, my brain is formed! I want to preload a thought in my brain before it comes out. It’s just different time-wise. You do both, right? Danielle: Yeah, and I do agree that they’re so different. With improv, I think it really depends on how you’re feeling and just what you’re vibing with that affects it. Whereas with stand-up, it’s the crowd and having good jokes, mostly. Danielle: It is like cheating! So what’s your most memorable moment in an open mic or a show? Lauren: I don’t know. There’s a lot of great moments, like my friends are doing real weirdo [stuff] or seeing stand-ups that love to do weirdo [stuff] where it’s like, “You can even do that?” I was seeing Maria Bamford for the first time and also Moshe Kasher was on that show. Maria Bamford’s my other favorite. Moshe I hadn’t seen before and he’s like Robin Williams up there. He never stops talking and it’s all planned. They both have a different delivery and cadence than everyone else. It’s just that way an anxious mind works and I so relate to that. Also, I would say all my friends, like Andrew Woods, who’s in Austin now, Tyler Simpson and Paulos Feerow. And I guess that’s the reason I wanted to do more improv because I’d see how loose and natural and free they would seem up there. It was always the funniest to me when they were being themselves, off the cuff. I felt so locked in, I was like, “Why can’t I do that! ?” Like in Pleasantville, when everyone else is in color and Tobey Maguire is black-and-white. Danielle: That’s such a good metaphor. Yeah, Tyler’s so good at that. It’s what I admire. I try to mimic it sometimes. Lauren: Yeah, we’re all just trying to be Tyler Simpson. Danielle: Oh no, I can’t put that in the blog. Lauren: He would like that too much. Danielle: Too much. So what can the crowd look forward to for your show on Friday? Lauren: So I have some fun things planned. I’m inspired by performance art, like school stories or stories where kids have to rebel against their parents to be creative, even though I have nothing to rebel against. So there’s going to be some fun and some interactive stuff. A lot of looseness, maybe some sketch, a character. Partially because this is one of the times to do it so I’m going to do whatever I want, and partially because I don’t have the material to fill the time. So you know what? Come out! It’ll be a fun, magical adventure together. And I’ll bring candy too. Danielle: Anything you’d like to promote? 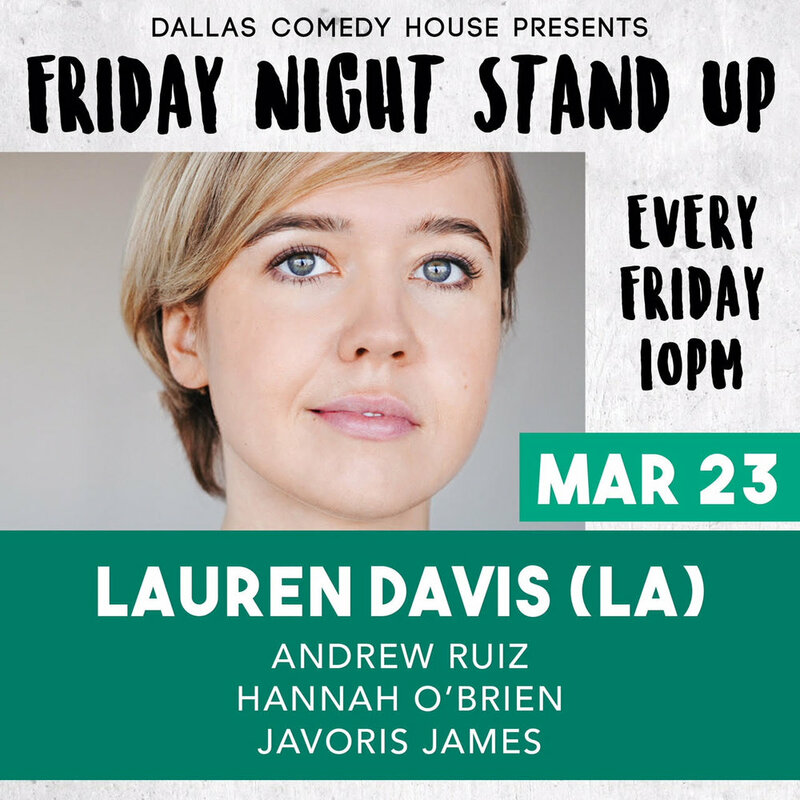 Lauren: On Saturday [March 31st] Sasheer Zamata will be at DCF and I have the honor of opening for her. Saturday night, we’re going to do some improv. That’ll be dope too. And I’m doing a short tour with the people I talked about earlier, Tyler, Andrew and Paulos, around Texas. That’ll be April 2nd through the 6th and we’ll release the dates soon. Danielle: Awesome, I look forward to that. And anything else you want to add? Lauren: Download the banter app. Me and my friend, who I’m casually dating, have a banter thread and banter’s an app where a bunch of comedians have text conversations every day. Download it, follow us, like it. And my Twitter’s @laurenorwhatev!